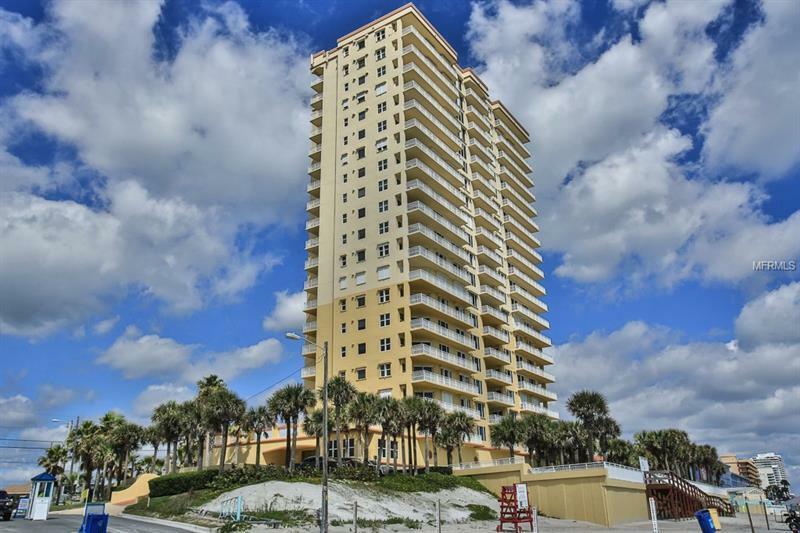 BREATHTAKING PANORAMIC OCEAN, CITY & ICW VIEWS from this gorgeous, beautifully renovated 3-bedroom, 3 bath, St Tropez floorplan, end unit at Daytona Beachâs luxury, Mediterranean Condo. Fabulous views from every room. Sliders access the 42ft oceanfront balcony from the living room & master bedroom. Both guest room sliders access an 8X11 sunset balcony. Laundry room & storage room in condo plus extra storage room in building. One reserved underground parking space, plus guest parking. Amenities include: oceanfront pool & spa, 2 fitness rooms, sauna, spacious outdoor terrace, 2500sf residents retreat w/ living room area, media room, billiards, bar area & kitchen. Minutes to Daytona Beach famous attractions including One Daytona, Daytona International Speedway, Main Street, Boardwalk, Ocean Walk Resort, Hard Rock Hotel, historic Ponce Inlet lighthouse; Minutes to Granada Blvd in Ormond Beach; Bel Air Plaza; restaurants; shopping. 2018 upgrades: kitchen w/ gleaming Shaker cabinetry and quartz countertops, stainless appliances, induction cooktop; drybar w/ wine/beverage cooler; electric tankless water heater; automatic blind in master bedroom; new ceiling fans in bedrooms; luxury, spa-like master bath w/ double sinks & soaker tub; 2017 upgrades: all new paint; Echobee wifi thermostat can be smart phone controlled; new lights in dining room & breakfast nook; Tesla charger in garage is negotiable; furnishings negotiable outside of closing. Very attractive pet policy.